Want to know more about making chocolate-covered strawberries? Learn about tuxedo strawberries, chocolate-covered strawberry roses and more! Fresh strawberries, covered in chocolate! Strawberry and chocolate are two tastes that just seem made for each other, and everyone that's tasted them loves them! Have you tried them yet? 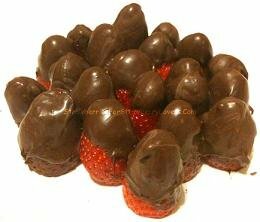 Here at StrawberriesForStrawberryLovers.Com, you can learn all you need to know about how to make chocolate-covered and chocolate-dipped strawberries. Making chocolate-covered/-dipped strawberries is very simple, and there are several easy recipes for chocolate-covered/-dipped strawberries! Click here FIRST for a faq with answers to general questions about preparing the chocolate and strawberries for a chocolate strawberry recipe, and proper storage (e.g. "What is the proper method for melting chocolate for strawberries?"). For chocolate-covered strawberry recipes, you can always simply pour chocolate over strawberries, of course. In addition, there are also strawberry truffles, and you can carve strawberries to make a few chocolate-covered strawberry roses! If you would just prefer a simple recipe with strawberries and chocolate pudding, try a chocolate strawberry trifle! These are great to eat by yourself, but they really shine at parties... a great way to add a special touch! So if you love strawberries AND chocolate, you're in the right place here at StrawberriesForStrawberryLovers.Com, Home of the World's Happiest (chocolate-covered!) Fruit!